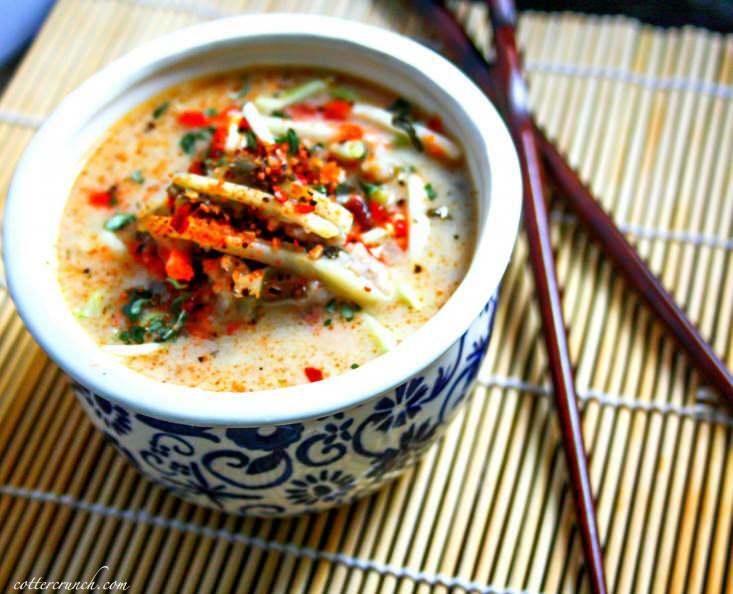 Thai Coconut Milk Cabbage soup packed with flavor and nourishment! 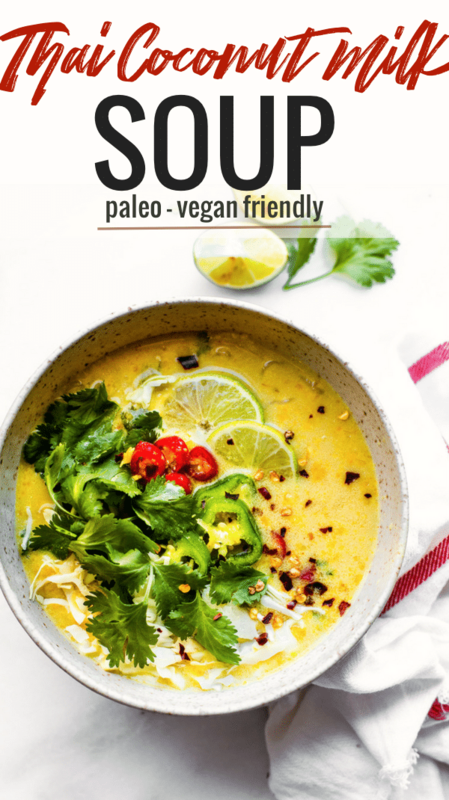 A Thai Coconut Paleo soup recipe made with real ingredients; coconut milk, cabbage, lemongrass, broth, curry, and Thai Chili peppers. It is quick to make, plus it keeps you warm during winter! Vegan and whole 30 friendly. Just letting you know this Thai Coconut cabbage soup recipe was originally published in December 2014. I retested and improved the recipe, rephotographed, updated content. Now I am republishing it for you today! I hope you enjoy. Thank you for following Cotter Crunch Y’all!. This week, the love of flavor packed recipes continues, in the form of soup that is! 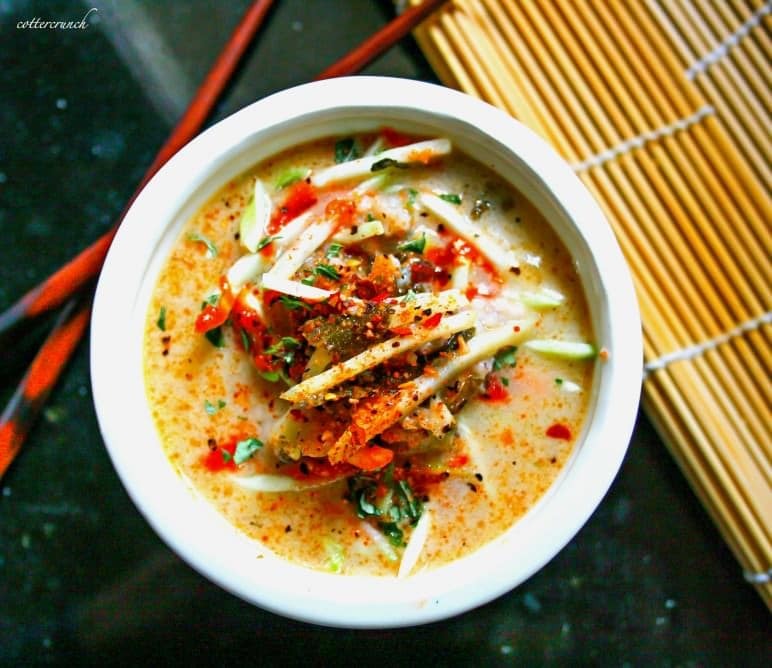 But let me explain what makes this Thai coconut soup the perfect soothing dish for body and soul as well. Hang with me, I’ll get to it soon! You see, when the body (or at least my body) is under a certain amount of stress, digestion needs a little more support. This is why it’s so important to focus on getting nutrient dense foods in the system, as well as taking a chill pill. Am I right? But what nutrient foods work for me, might not work for you. So can be tricky. The body responds differently to certain foods for EACH person depending on the environment they are in or their current health condition. Hence why I posted the “healing foods” meal plan last week. 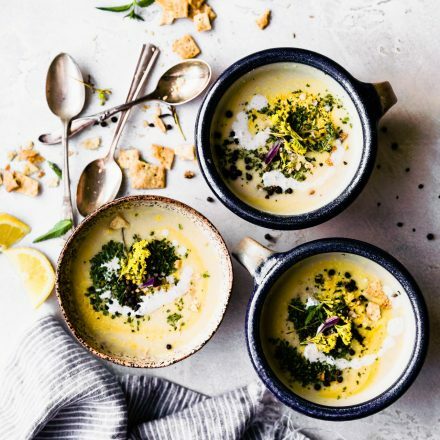 For us Crazy Cotters, immunity boosting smoothies, Turmeric teas, and anti- inflammatory rich soups give us more bang for you buck, per se. Easy to digest, but still full of nourishment. Nourishment in the form of soothing herbs, vegetables, and spices! 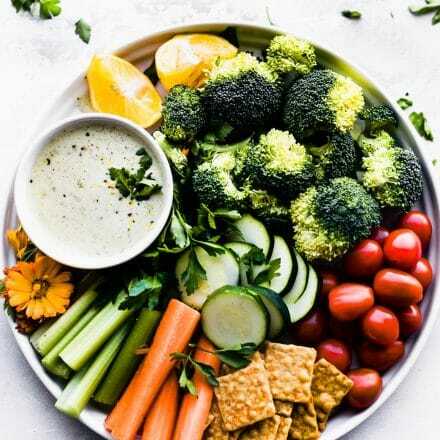 Adding in herbs and spices are also a great way to significantly increase the nutritional value of your meals, plus many herbs and spices serve as digestive aids. 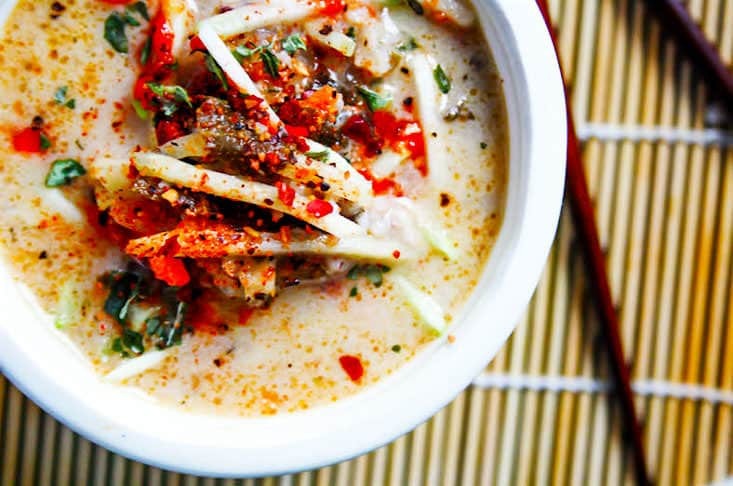 Hence my love affair with paleo thai coconut soup! 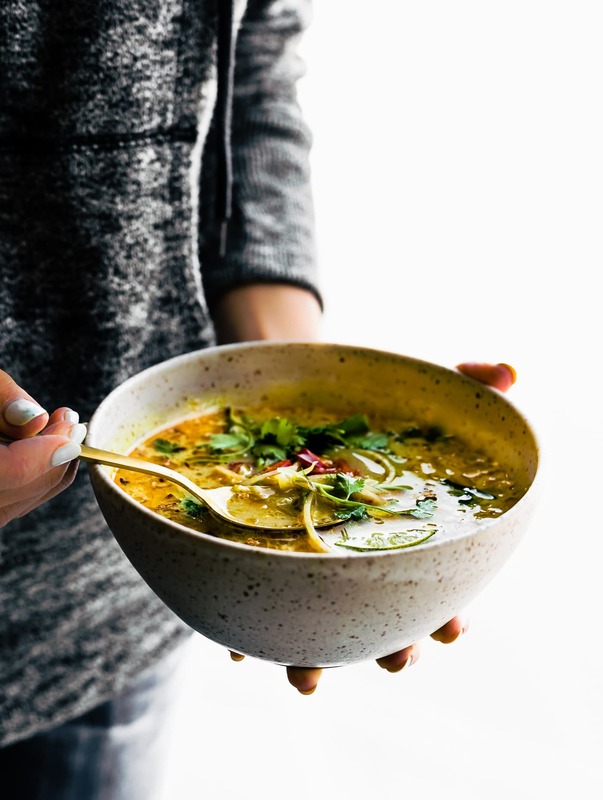 It’s full of good for your health medicinal herbs like lemongrass, anti-inflammatory rich spices (like curry), antioxidant rich peppers, and healthy fats (like coconut milk), etc. Not to mention good for your digestion vegetables, like cabbage! 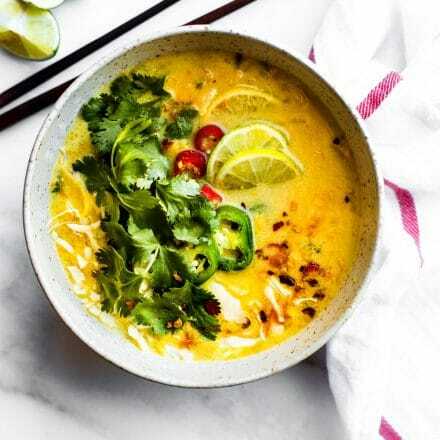 Adding cabbage brings extra nourishment and texture to this Thai Coconut Milk Soup! Yep! Instead of grains (like rice), we are using shredded cabbage. Whoa I just said LIKE a lot. But you get my point. I LIKE what’s in this soup. You can use red or green cabbage for this Thai soup. Both red and green cabbage are rich in minerals calcium, magnesium, and potassium. Three essential minerals that are crucial for protection of bones. As if that wasn’t enough, some studies have shown that cabbage may help improve the health of the stomach and digestive tract as a whole. You can thank the anti-inflammatory rich glucosinolates found in cabbage for that (source). Oh and fiber, cabbage has tons of fiber, obviously. Is that enough nerdy nutrition talk for ya? Ha! But gosh darn I love it when food can play a KEY part in healing and health. Alright, now you know why I love this soothing soup and why I am sharing it AGAIN today, 3 years later. The recipe is retested and improved. HOORAY! 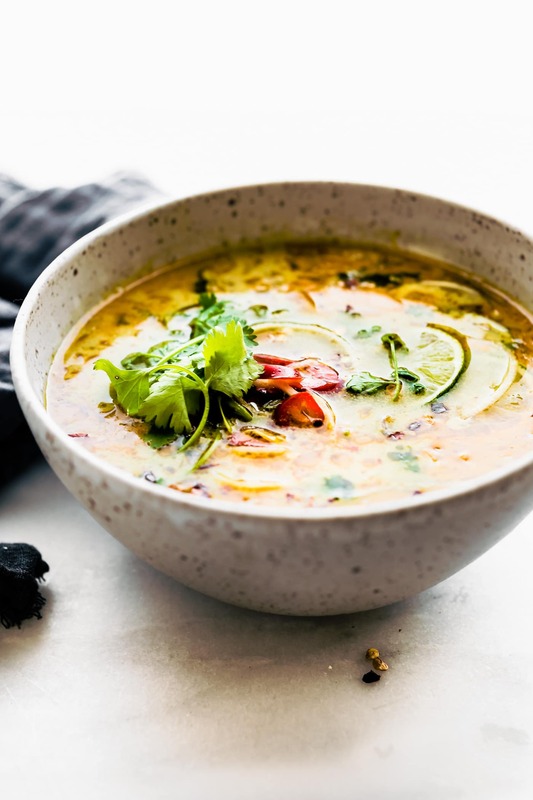 This nourishing Thai soup is quick to make with simple ingredients. 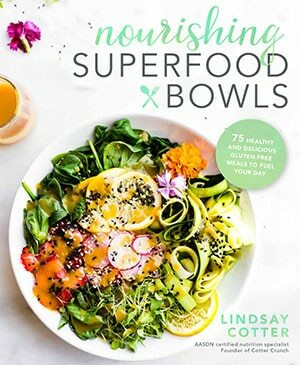 Low Carb, Paleo, Whole30, and Vegan friendly. 2 to 3 cups shredded cabbage (red or green) – see notes. Optional add ins: Cooked shrimp, chicken, tofu, sriracha, mushrooms, etc. In a large pot, sauté your shredded cabbage in oil, 1 tbsp lime juice, 1 tsp minced garlic, and dash of pepper. Cook about 2 minutes on medium to medium high. Be sure not to cook all the way. Remove cabbage from pot and set aside. In the same pot, bring to boil your broth, lemon grass, and the rest of your spices/chili paste. Let is simmer about 10 minutes on medium low, stirring occasionally. 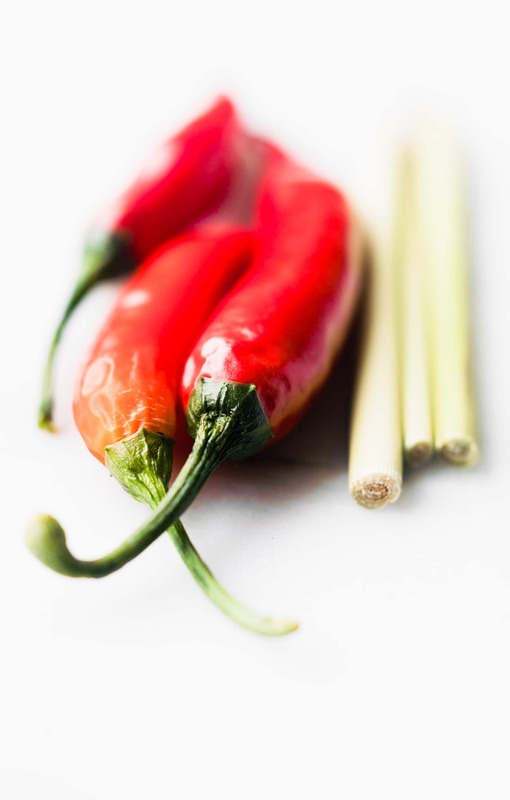 When soup is done simmering, you can either add your sliced Thai Red peppers into the pot before serving, or use them to garnish. Spoon into bowls. Garnish with fresh lime slices, spicy pepper slices (i.e jalapeños or additional Thai red peppers), drizzle of chili sauce, and pinch of pepper. Optional chopped scallions to top. You can use Thai basil if you don’t like cilantro. 2 stalk fresh lemongrass, cut in 1-in. pieces will equal around 1- 2 tbsp lemon grass paste. Protein is optional, but you can add in a cooked protein of choice (i.e shrimp, tofu, chicken, etc.) at step 6. When you mix in and simmer the coconut milk and cabbage. Now let’s get get cooking! Your body and tastebuds will thank you. What are your favorite type of vegetables to use in thai coconut soup? 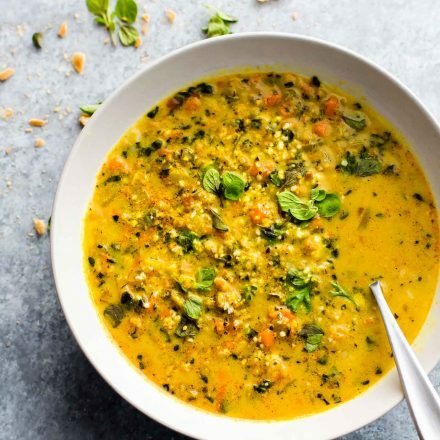 This looks like the prettiest soup I’ve ever seen in your photos! Really creative and delicious looking recipe too, yum! I made a thai soup the other day too! It was delicious, and this sounds like it would be great. Love the addition of cabbage, I would never have thought of combining those, but yes, great for your gut! Yum! I love the combination of flavors here. I totally agree that soups are a great way to pack in a ton of nutrition. P.S. I just took the plunge and ordered some gelatin. Thanks for the recommendation. The kind that you linked to. Great Lakes? In the red tin. I love Thai foods and haven’t tried making my own yet. Sriracha is never optional. This reminds me of Tom Kha Gai, which I usually can’t order in restaurants because I don’t know exactly what they are using, but which I think is just a delicious soup. And as someone with a digestive illness, I can tell you–stress plays a HUGE role in gut health, and gut health plays a HUGE role in stress! 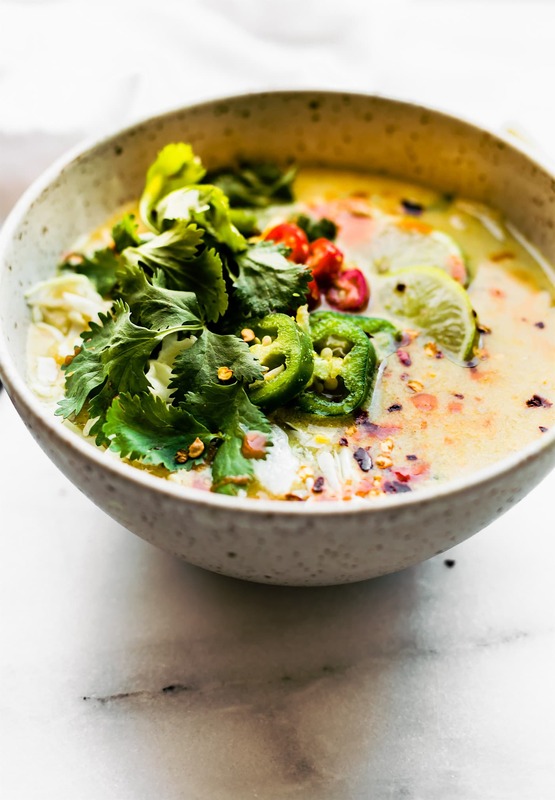 Gahhh I love coconut milk and I love soup–match made in heaven! Coconut tastes so good savory and sweet- I need to try more recipes like this with it savory!! OMG this looks so good! I’m making ramen this week. Close-ish? Come over and do an Asian soup swap with me. Jason was just talking about making a soup like this when we were at the grocery store yesterday. i don’t know how you do it. I would freeze! LOL! Yum! That looks great. Already pinned. I’ve never seen those broths before-are they vegetarian?? Thanks for linking up with us this week. We plan to do soups and stews in January so hope to see more of your recipes. a few of them are. and a few have chicken stock in them. SOOOOOO GOOD! you must try! yum . . . love me some of that soup! Yummm that even looks good to me and I don’t like coconut. I feel like I need to get over my distaste for it though so many paleo recipes have it. What’s a girl to do? you can sub out the coconut milk for vegetable broth or even a little cream! I would use 1/2 cup cream and then the rest broth to make up for the coconut. NO prob! You’re killing me. 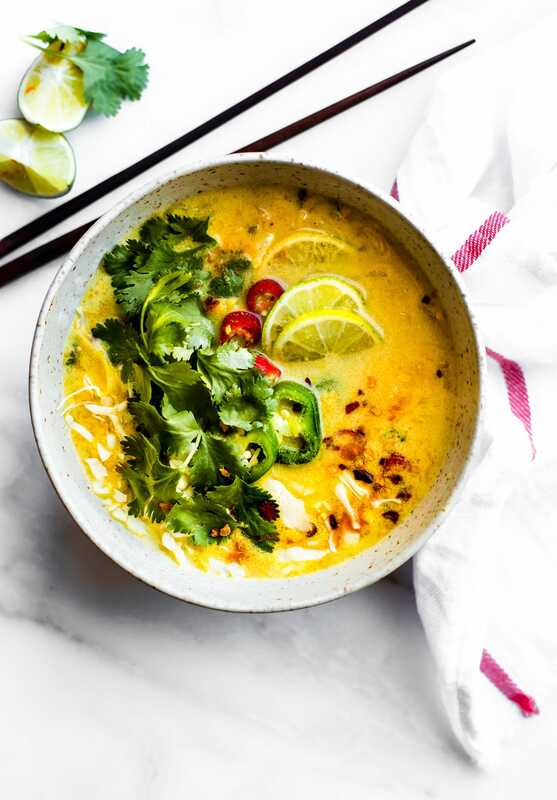 You must be a mind reader– I’ve been craving an Asian inspired soup! This is making my mouth water! Sounds fabulous! And thanks for the tip on the broth–I’d never heard of it. We have a couple of great Asian markets nearby so I might see if I can find it there. Love me some Thai and the Caveman is a cabbage fiend! Need to make! Yum! I actually don’t make soup often but this looks great! Love the flavor combo! I LOVE soup – especially this time of year. Sounds fabulous, as always! This looks soooo good!! I absolutely LOVE coconut milk. I love to make it in a soup with lemongrass! Like Tom Ka Gai. My husband would love this soup! it’s husband approved here too! I need to find that bone broth, been wanting to see how that helps my tummy but no way am I going to make it myself. 🙂 This soup sounds delicious too!! This is soup time for me, I crave it!! check whole foods! i found several there too! Oh, wow. Thai coconut soups are my favorite. I’ve made several versions but I’ll have to try this one! Yummy!! I love anything thai. This looks light and refreshing! HAHAH all about soups and smoothies these days…Although I’ve backed off on the soup a little bit, cause it’s so darn warm here in Houston…Got the AC on today! Sheesh…. When I’m feeling bad (GI bad, that is) I make this soup that I learned about when things were REALLY bad for me. I steam equal parts spinach, green beans, zucchini, and parsley and then puree with the steaming water. You only need a pinch of salt and it is truly delicious! that sounds amazing! i need to try that next. thanks! how are you by the way? thai thai thai! yummy yummy yummy!!!!! i love all thai things especially coconut. need this in my belly this winter! I don’t know how you do it but this looks amazing. I’m a souper star. Thought you’d appreciate that. I adore the flavors in here and also happen to have a cabbage or two in my fridge right now. I could pretty much live off soup this time of year. True story: I’m actually reheating some of Saturday night’s Minestrone Soup for dinner tonight, along with a butternut squash drop biscuit. Mmm, can we somehow make those good for gut health too?! Yum! Veggie broth and it’s vegan. It looks absolutely beautiful. And my list of cotter creations to make grows longer! Seriously though tis the season for soup and a bowl of this sounds incredible. 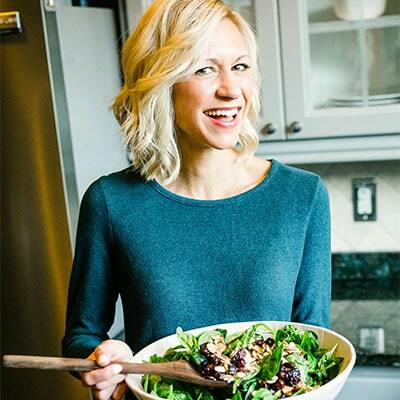 So much great gut info AND a delish recipe!! You are all over the cooking lately & doing a great job!!!!! for sure! let me know if you try it Katie! WOw we loooove thai food!I want to try that out!! I LOVE SOUP!!! and coconut flavor is my latest obsession for everything! this sounds delish. I love adding basil to soup…simple but so tasty. I LOVE coconut and curry flavors lately. Awesome. Girrrrl! Your photography has improved SO much!!! This sounds amazing and it looks GORGEOUS! you are kind. Thank you! I’m really working on it for healthy bites, sizzlefish, etc. This is a great recipe. I love everything about it – it’s affordable but clearly flavourful, it feels authentic, and it’s bright… Great work. 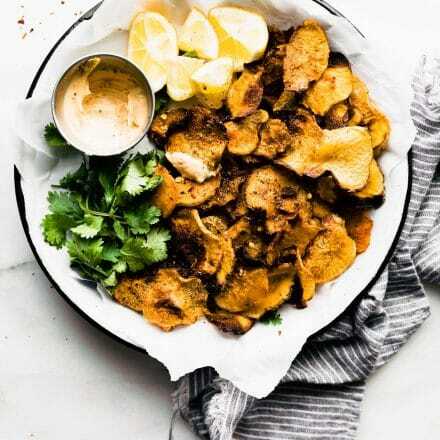 I featured it in my round-up of vegetarian paleo dishes this week (http://immigrantstable.com/2015/01/09/best-vegetarian-paleo-recipes), so thanks for sharing!! Great! thanks for the link Ksenia! keep me posted! it;s my fav! Does this recipe double well, or freeze well? Looking for something different for a soup swap! Looks so good, I will try it soon! I think it freeze quite well. Just have to mix the coconut milk up again once thawed. Easy! Doubling works as well but I would adjust the lemon grass and other spices to your liking once double. Just taste it and continue to add bit by bit. Does that make sense? This was absolutely delicious! So much flavor! I bet this packs a punch of flavor! Looks delish Lindsay! 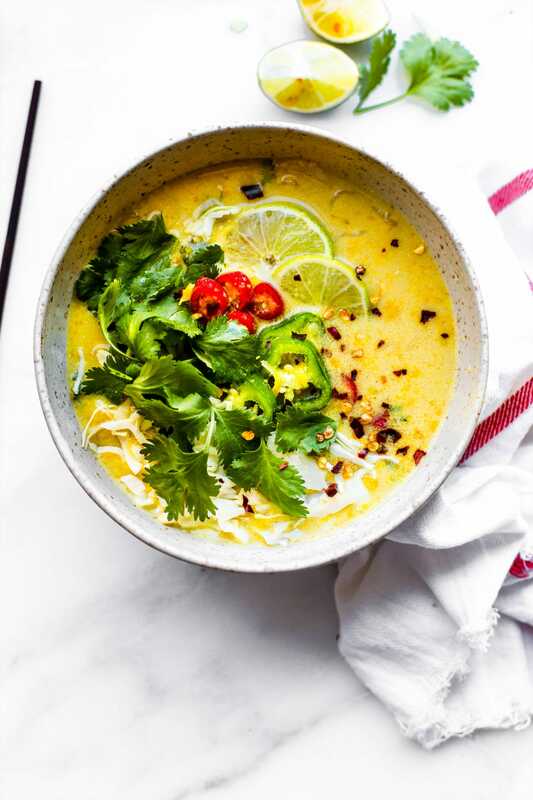 Oh my, this Thai coconut soup looks wonderful! I love how packed with nutritious herbs and spices it is, plus you can customize it any way you wish! Love the spicy kick in this! 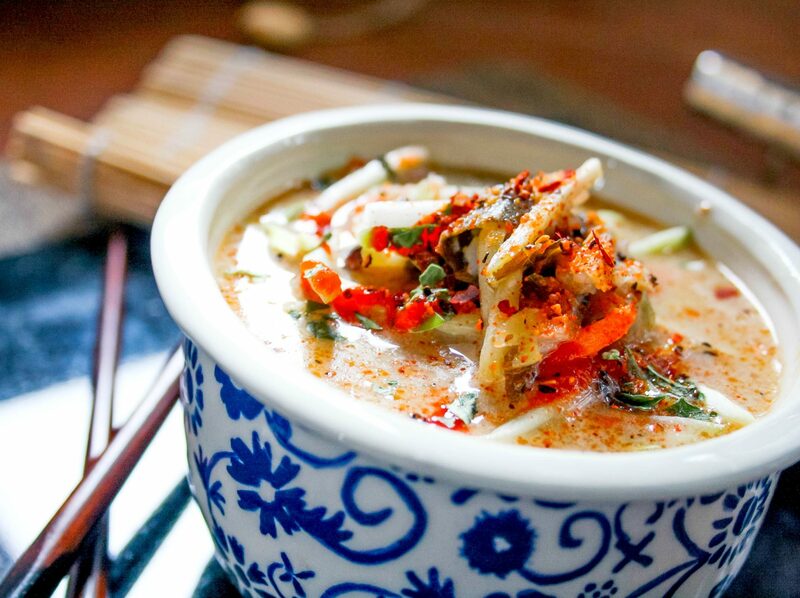 Love cabbage soup and Thai flavors… so I am like 99.9% sure I’d love this soup! This soup looks so comforting and cozy! Love coconut milk, makes everything so creamy and delish! Doesn’t it? So good that coconut milk! Retest or not, I want to skinny dip in the bowl of amazingness. Did I mention I’m freezing right now too? The first time since I was pregnant with Ave; maybe this means my hormones are finally regulating. Fingers crossed; now pass me a spoon please. That is one beautiful soup! This has become my breakfast wake-me-up soup!! Love it, great flavours. p.s. Love the site too, though I don’t think my printer does! I love soup so much! YOur coconut milk recipe looks very tasty! I will try at home! Oh really? Did you use purple cabbage? I used green but purple or red totally work! Glad you liked it though. I like its sharing. Thanks you for very interesting information. Wonderful!! THanks for letting me know David. This looks amazing. My belly has been off since the em holidays. Can’t wait to dig into this. I plan to make this right now, it looks like a good healthy soup on a chilly day. I have some extra kaffir lime leaves – do you think I could add these in too? Thank you for the recipe! sent you an email! hope it worked. Love the lime leaves! He thought it was delicious, and plenty left over for tea tonight. Love it! So glad Anne!